The Requiem has had a chequered career. When his arch rival Bellini died in 1835 Donizetti was asked by Riccordi, their joint publishers, to write something suitable. Lament on the Death of Bellini was the outcome but then, from Naples, came a request for a Requiem Mass. Donizetti started the project, but there was insufficient time, the promoter backed out and it remained unfinished. The Mass never received a performance in Donizetti's lifetime and was only published in 1870 and was performed that year in Santa Maria Maggiore in Bergamo where Donizetti had been a choirboy. It was later used for the ceremony when Donizetti's remains were moved to a grander setting. So although it was written for Bellini in fact, it was used for the composer. It has been revived serveral times since and is now recognised as one of his most important non-opera compositions. The Mass lacks certain parts, a Sanctus, a Benedictus and an Agnus Dei, which were presumably never composed. Equally some of the orchestrations differ according to the versions used. 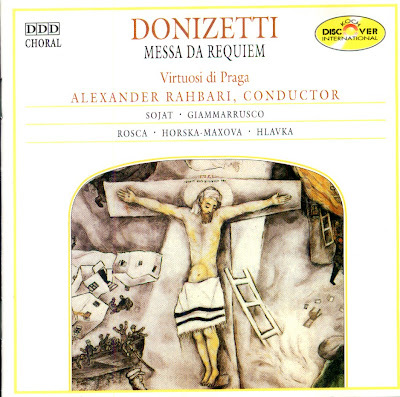 However what exists shows Donizetti to be a powerful and compelling religious choral composer and Verdi must have known this piece when he came to write his own version of the Requiem. The introduction has Mozartian overtones, the Kyrie a particularly strong, woeful feel, heart-breaking in its intensity; whereas the Dies Irae is a splash of colourful orchestral writing - very operatic and dramatic. There are hints of a Neapolitan song and some music which is delightfully sentimental. The solo parts are well written, especially in the Preces Meae where the brass predominates and in the later sections, where the music takes on an almost impressionistic feel. The Compact Disc was released by Koch Discover International, 1997, (DDD). DICD 920519.